Let’s say that for whatever reason you don’ have laundry detergent. Perhaps you forgot to purchase any when you were last at the supermarket. Or maybe you just ran out and don’t feel inclined to go shopping (who does?). Maybe you’ve just decided to give up on all of those chemical things, soap included, so you are looking for some kind of alternative to laundry detergent. Fortunately, there are viable alternatives. Whatever your reason is for needing an alternative to laundry detergent, there is an alternative listed here. Just deciding to “go without” is a great reason for looking elsewhere when it comes laundry time. The good news in this is that there are plenty of alternatives. Some are a little risky, but used with a certain degree of caution, they’re fine in a pinch. Soap Nuts. No. They’re not really a nut. Instead, they are a fruit, but don’t get us mixed up in that debate. Regardless of what the plant folks call them, they’re great in your laundry. Soap nuts come from a plant called soapberry, the shells of which produce a soapy effect when they are added to laundry. You can buy them from a website called Naturoli (shameless plug). And not only are they all natural, but they also cost only pennies per load. Ava Anderson’s Laundry Pods. Another alternative to traditional laundry soap is Ava Anderson’s Laundry Pods, which are a full of natural ingredients that are non-toxic, septic safe, safe for kids and pets, and lots of other cool stuff. Oh, yeah, and they clean your clothes too. If you’re not quite that ready for going natural, you can still make wonderful detergent for your wash with, what else, soap. Wow. Bet you thought we had to have a big meeting to think of that one. Fortunately, it’s true. In fact, many people do it all the time. The downside is that is that if you want to do it, you need to be careful, since some products, like dishwasher soap can be damaging to your clothes if you’re not careful and you use too much. A similar approach is to use regular bar soap and grate it up with a cheese grater, then add it to your wash. 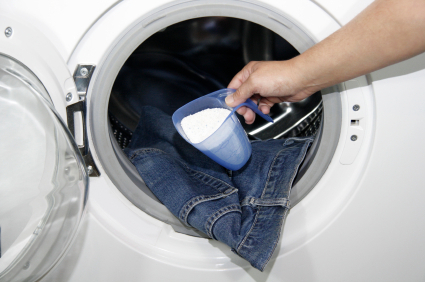 The easiest alternative, by far, is to go online and schedule a laundry pickup at The Laundry Center. They know all of the tricks of the trade when it comes to doing laundry the right way. Even better, they offer free pick up and will deliver your laundry as fast as 24 hours. I’d bet your supermarket doesn’t do that. This entry was posted	on Tuesday, March 22nd, 2016 at 8:46 pm	and is filed under Laundry Service. You can follow any responses to this entry through the RSS 2.0 feed. You can leave a response, or trackback from your own site.